"I made this up to go with some grilled salmon and boy, it sure turned out a lot better than I expected! A nice twist on the old scalloped potatoes." Preheat oven to 350 degrees F (175 degrees C). Grease an 8x8-inch baking dish. Brush sweet potatoes and squash with olive oil. Arrange sweet potatoes on a baking sheet; set squash aside. Bake sweet potatoes in the preheated oven for 5 minutes. 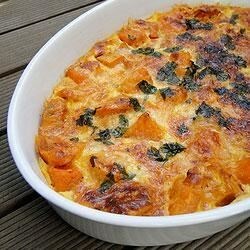 Add squash to sweet potatoes; cook until almost tender, 10 to 15 minutes. Remove and cool. Heat butter in a saucepan over medium heat; cook and stir onion until tender, about 10 minutes. Add flour, milk, and sage; season with garlic salt and black pepper. Cook and stir until flour is dissolved and sauce is thickened, 5 to 10 minutes. Remove and discard skins from sweet potatoes and squash. Thinly slice sweet potatoes and squash. Arrange sweet potato slices in the bottom of the prepared baking dish. Layer half the squash atop sweet potatoes. Pour a little less than half the cream sauce over squash. Sprinkle with half the Asiago cheese. Repeat layering with remaining squash, cream sauce, and Asiago cheese, respectively. Cover with aluminum foil. Bake in the preheated oven for 25 minutes. Remove foil and bake until cheese is melted and bubbling, about 10 more minutes. Learn how to make maple syrup- and dark rum-glazed butternut squash. If it seems like there is not enough sauce after preparing the second layer, you can pour 1/2 cup milk over the top to add a little more liquid. This dish was so tasty. I added a carrot along with the sweet potatoes and butternut squash. The combinations of flavors make this an excellent dish. Delicious! You can also substitute shaved parmesan cheese and a little grated parmesan cheese for the asiago, as I did. Great recipe!! I didn't have asiago on hand, so I used goat cheese and mozzarella. This is a really great recipe and tasted so delicious!